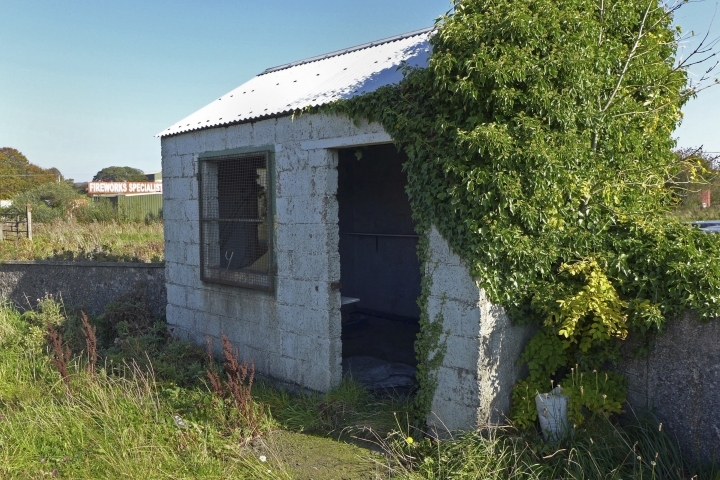 CARRICKCARNAN, Ireland — The land around the small Irish town of Carrickcarnan is the kind of place where Britain's plan to leave the European Union runs right into a wall — an invisible one that's proving inordinately difficult to overcome. Somehow, a border of sorts will have to be drawn between Northern Ireland, which is part of the United Kingdom, and EU member Ireland to allow customs control over goods, produce and livestock once the U.K. has fully left the bloc. That means the largely unpoliced and invisible Irish land border will become the boundary between the EU and the U.K. — raising vexing questions about trade and customs checks. Of all the thorny issues in Brexit negotiations, this has been the toughest, because the challenge of keeping trade running smoothly is deeply entangled with questions of identity: what it means to be from Northern Ireland. 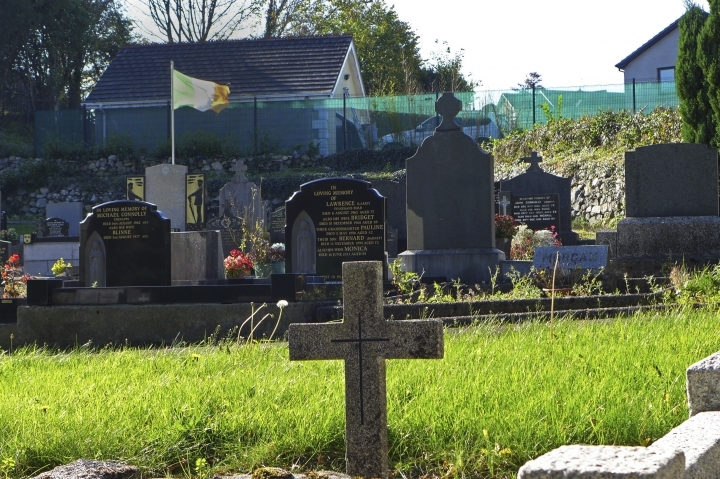 Northern Ireland's Catholic and Protestant communities remain divided decades after 30 years of conflict claimed around 3,700 lives. The peace agreement signed in 1998 provides people with the freedom to identify as Irish or British, or both. It helped dismantle Northern Ireland's once heavily-policed and militarized border with Ireland — and the last thing people want now is a new one. "The peace process took identity and borders out of politics. Brexit has put them slap bang back into the middle again," lamented Northern Ireland business and strategy adviser Conor Houston. Talks between EU leaders and British Prime Minister Theresa May ran aground this week over the Irish border issue, and are trying to find ways forward ahead of a summit starting Wednesday. The Northern Ireland-Ireland border zig-zags all over the map. It cuts around properties, veers over roads and dodges villages. People cross it when they leave home to visit their doctor or go shopping. It's mostly only visible when the speed signs change from kilometers to miles. The dividing line stretches for 500 kilometers (312 miles) and is dotted with over 250 official road crossings, more than on Europe's entire eastern flank. A fine example of the Brexit conundrum is the Jonesborough Parish Church. 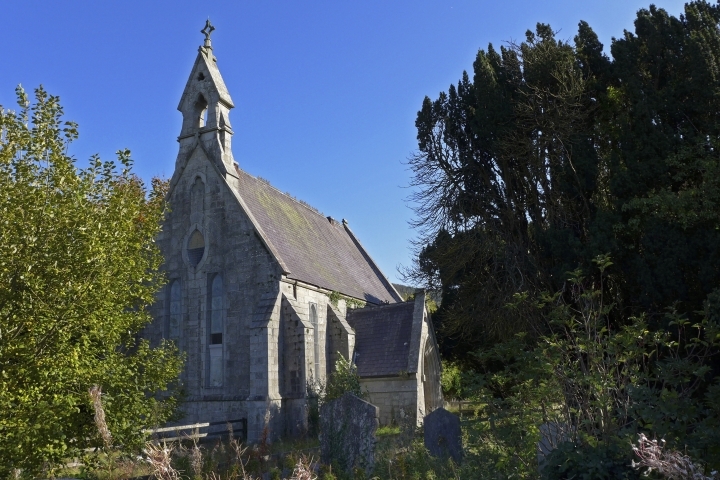 A padlock secures the gate of this run-down Protestant place of worship in the U.K. An Irish flag flies in the cemetery next door, over the border. 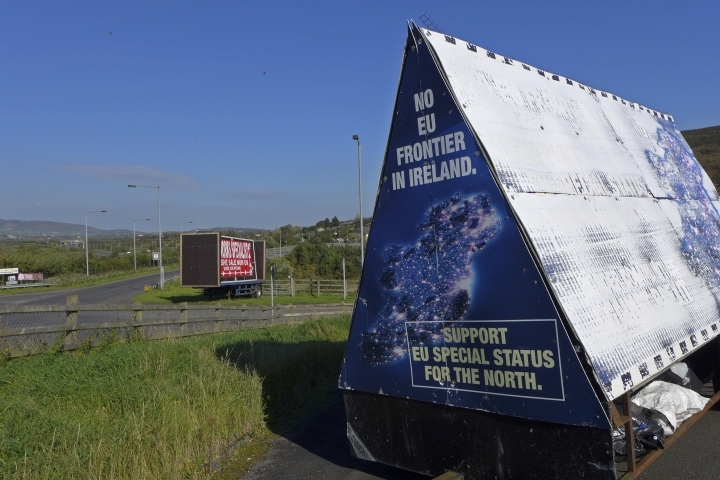 In the parking lot, a weather-beaten sign reads: "No EU Frontier in Ireland." Not so long ago, 12 fortified watchtowers, 4 helicopter bases, a handful of army barracks and police stations dotted the countryside within a 10-mile (16-kilometer) radius. Border posts stood for authority and made easy targets for paramilitaries. So police came to guard the customs officers. Then the army was called in to protect the police. Some think that modern technology — drones and cameras — can defeat old enmities. Others suspect they would be used for target practice. 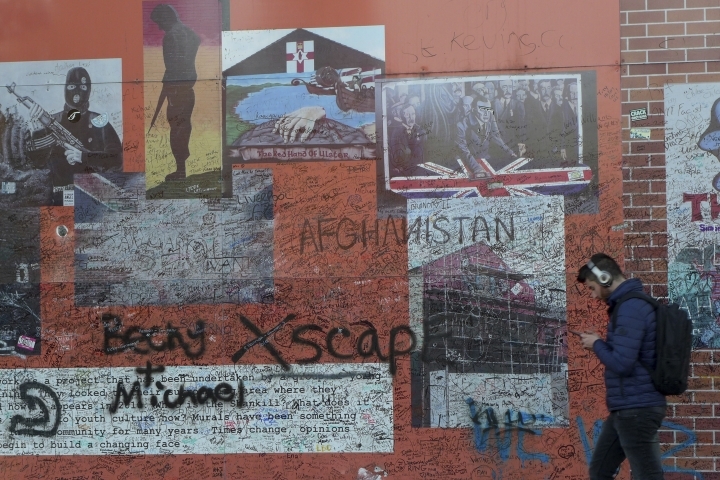 "For some, that will be seen as surveillance and a throwback to the troubles. Then you're going to have to decide how to protect those drones and cameras," said Peter Sheridan, a retired senior police officer with 32 years' experience in dealing with organized crime. Still, Sheridan says politicians should not cave in to threats. "We cannot be pressured into decisions by those who wield the biggest stick," he said. About 65 kilometers (40 miles) to the north, in Northern Ireland's capital of Belfast, the barriers are far more visible. 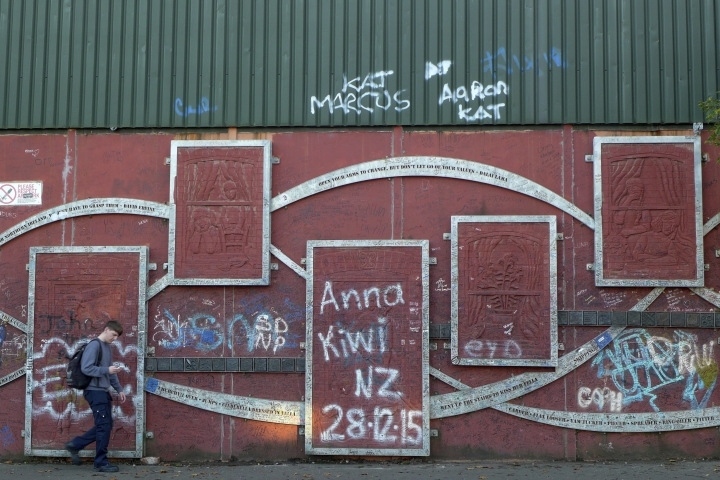 In many places, neighborhoods are still separated by high, graffiti-daubed "peace walls." Schools are mostly segregated. The territory has the U.K.'s highest poverty, suicide and unemployment rates — and there are fears that Brexit might make things worse. "The tensions just can't be underestimated and it's absolutely pervasive" in parts of Belfast, said Angila Chada from Springboard, a group working with unemployed Protestant and Catholic young people. It's not all bad news. Trade — mostly in the agricultural and food sectors — has doubled in the last 20 years and Northern Ireland's economy has steadily improved. Still, even in the best Brexit scenario, Aodhan Connolly of the Northern Ireland Retail Consortium notes there will be "a substantial new administrative burden." More checks on goods crossing the border will mean more paperwork. That means delays, and delays create costs. "There is very little wiggle room for business. These costs will get passed onto the consumer," Connolly told reporters during a visit to Northern Ireland organized by the Irish government. "It's literally death by a thousand cuts. The food prices will go up, the fuel will go up, the shirt on your back." Creating a "hard border" — something all parties want to avoid — would make things worse. On average, commercial vehicles cross the border 13,000 times each day. In the future, around 3,000 loads a day carrying beef, lamb, pork, poultry, eggs or dairy products might have to be stopped. Each check would take about 10 minutes, said Seamus Leheny from Freight Transport Association. "We would have paralysis here on the border," he said. Whether customs and other checks could be done away from the border — at airports, ports, factories or markets — remains to be seen. In coming weeks, EU officials and the British and Irish governments must come up with a policy which guarantees that goods can be controlled without stifling the economy. Above all, the Brexit Irish border plan must respect the unique identities of Northern Ireland's people and not inflame tensions, as many fear it might.